The Varsa Double Tungsten ENG Kit with V-Mount Battery Plate from Nila is a great choice for location or the studio. 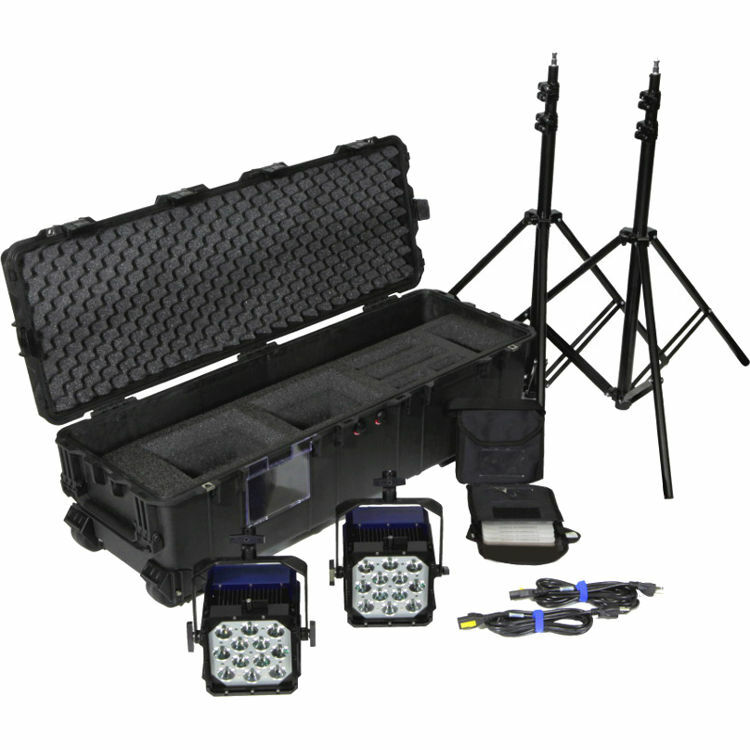 The kit includes 2 Tungsten Varsa LED fixtures, each with a V-mount battery plate, 6 holographic lenses, CTB gel set with pouch, a light stand, and a set of 4-way barndoors. A Chimera Pro Plus softbox is also included as is a hard case to store and transport it all. The Varsa Tungsten LED Fixture from Nila is a tungsten-balanced LED fixture that draws 70W, yet it is as powerful as a 600W tungsten fixture. In addition, it is power factor corrected for improved efficiency. Featuring instant-on operation, there is no waiting for the light to come up to temperature or brightness, and the built-in dimmer provides 0-100% adjustment with consistent color reproduction throughout the dimming range. The fixture supports wired and wireless DMX control for remote dimming. The fixture is flicker-free up to 5000 fps at any dimming setting, and the long-life LEDs are rated for a lifespan of up to 60,000 hours. This versatile light also sports a robust aluminum-alloy housing with an anodized finish and a built-in chimera mount. It is power factor corrected, which means that it incorporates technology to make it more power efficient, ensuring that its actual power usage is closer to its rated power draw than if it was non-power factor corrected. The 40 Degree Medium Holographic Lens for Varsa LED Light from Nila changes the light's beam spread. The 20 Degree Spot Holographic Lens for Varsa LED Light from Nila changes the light's beam spread. The 10 Degree Narrow Spot Holographic Lens for Varsa LED Light from Nila changes the light's beam spread. The 10 x 60 Degree Elliptical Holographic Lens for Varsa LED Light from Nila changes the light's beam spread. The 60 Degree Wide Holographic Lens for Varsa LED Light from Nila changes the light's beam spread. The 80 Degree Flood Holographic Lens for Varsa LED Light from Nila changes the light's beam spread. This Varsa CTB Set from Nila includes a 1/8, a 1/4, a 1/2, and a Full Color Temperature Blue filter. These filters are compatible with the Nila Varsa Light Fixture, which has an integrated faceplate that can accommodate one filter at a time. Each of the filters in the Varsa CTB Set can be used to conveniently raise the color temperature output of a Varsa light fixture installed with a tungsten color temperature bulb to a daylight color temperature instead. Depending on the color temperature of the tungsten bulb being used, a Varsa light fixture's faceplate allows the filters within this CTB set to be exchanged in order to obtain the desired daylight color temperature output. These filters have a Full, 1/2, 1/4, or 1/8 grade. Each grade corresponds to that of a -131, -68, -30, or -12 mired shift, and reduces the output of a light source by 1.5, 0.9, 0.4, or 0.3 stops respectively. The 4-leaf Varsa Barndoor Set from Nila fits on the front of the fixture, allowing you to control and contour its light output while reducing spill light. The Super PRO Small LH Lightbanks for Nila Varsa LED Lights from Chimera are low heat (LH) lightbanks designed to moderate light from LED sources. They offer soft silver interiors made from sturdy materials and fit the Nila Varsa LED lights. Included with the lightbank body are the poles, 1/8th grid internal baffle, removable front screens and carry sack. Support your Varsa or other up to 16.5 lb light with the black, non-glare Air-Cushioned 8' Compact Light Stand from Nila. This lightweight, three-section stand is included with Nila's ENG Kit. It has a 3' wide footprint, non-slip leg tips for stability, a 5/8" adapter, and a 32" to 8' height range. For strength, durability, and reduced weight, the stand is constructed of heavy-gauge aluminum tubing. Photographers will appreciate the air cushioning that helps prevent personal injury, damage to gear, and makes lowering heavy loads easier. Store, transport, and protect your Double Varsa ENG Kit in the Double Varsa Case with ENG Insert from Nila. The case holds two full Varsa Deluxe Kits. Inside the case are slots designed to house your battery adapter plates, Chimera Soft Box and light stands. The case is a rolling Pelican case made with a Nila ENG insert. Box Dimensions (LxWxH) 7.8 x 7.4 x 2.2"
Box Dimensions (LxWxH) 6.0 x 6.0 x 0.2"
Box Dimensions (LxWxH) 5.9 x 5.8 x 0.5"
Box Dimensions (LxWxH) 6.1 x 4.3 x 0.5"
Box Dimensions (LxWxH) 6.2 x 3.1 x 1.0"
Box Dimensions (LxWxH) 5.9 x 5.8 x 1.4"
Box Dimensions (LxWxH) 8.0 x 8.0 x 3.0"
Box Dimensions (LxWxH) 9.7 x 9.5 x 2.4"
Box Dimensions (LxWxH) 28.0 x 4.25 x 4.25"
Box Dimensions (LxWxH) 8.7 x 5.3 x 2.3"
Box Dimensions (LxWxH) 36.0 x 3.0 x 3.0"
Box Dimensions (LxWxH) 45.0 x 16.0 x 15.0"